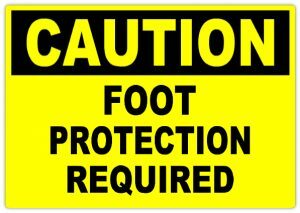 When we think of safety generally we don’t think of foot protection until we injure one or both of them or your site has special requirements for footwear. Selecting the proper foot wear is very important for different jobs, you wouldn’t want to wear work boots to play basketball, or wear tennis shoes to pour concrete. Similar to selecting the correct glove for the task at hand choosing the right boot for the work you are conducting can make an impact. department to find out if your site has special requirements when it comes to foot protection. Other things to consider are boot styles which could include a flat sole with no heel (wedge sole), a slip on style compared to laces, and boot length for ankle support. The material you boot is made of is important also. Is your boot made from leather, rubber, plastic, canvas and do you have the right material for the task. keep to help protect your feet from the cold and wet conditions we face in Michigan on a regular basis. Wearing insulated or rubber boots can cause excessive sweating of your feet be sure to dry your foot wear for the next work day, having an extra pair of dry socks, and foot powder can help with foot protection throughout the day. When your shoes become worn make the investment and replace them to keep your feet and the rest of your body feeling better. So remember select the right shoe for the job.